The five United States military service academies are some of the most elite schools in the nation, taking the finest high school students and turning them into commissioned officers of the Army, Navy, Air Force, Coast Guard, and Merchant Marine. Over 60,000 students a year begin the arduous process of applying, and about 4,000 get in. At West Point alone, over 15,000 candidates start the applications process. Less than a third of them finish it. Some figure out that they aren’t going to be competitive, some get derailed with specific problems, and some get lost and drop out even though they might have gotten in. From applications to Congressional nominations, from athletics to medical qualifications, the process is unlike any other for getting into college. This book leads students and their families through the process step by step, offering the tools needed for the very best chance of success. 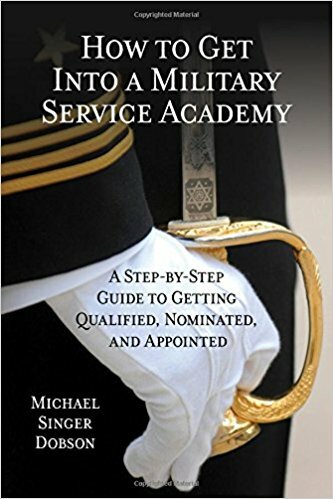 Covering special issues and concerns like LGBTQ, women and minorities, criminal records, and more, the author also discusses whether attending a service academy is RIGHT for the prospective student, and what he or she can expect upon acceptance, admission, and attendance. Using his personal experience in helping his son, now a West Point cadet, through the applications process, Michael Dobson provides all candidates with the ins and outs of the competition for a spot at one of these prestigious schools. IMPORTANT NOTE: This book has a separate website at militaryacademy.info. You can find up-to-date information and errata, and email Michael with any questions or issues you might have. Copyright © 2019 Michael Dobson. All rights reserved.